Mothers Mag and Aluminum Polish 10 oz. Mothers Mag and Aluminum Polish 10 oz, Mothers 05101 Aluminum Polish, Mothers Aluminum Polish, Mothers Aluminum Intake Polish, Aluminum Intake Polish, Intake Polish, Mothers Mag Wheel Polish, Mothers Wheel Polish, Aluminum Polish, Mag Wheel Polish [Mothers 05101 Aluminum Polish] - $7.95 : 3rd Strike Performance, Your Source for Late Model MOPAR Performance Parts and Accessories! Home :: Dodge Ram Parts :: 09-18 Dodge Ram :: Key Chains :: 10-19 Diesel Intake Kits :: Mothers Mag and Aluminum Polish 10 oz. 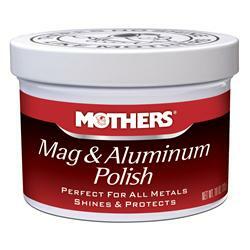 Mothers Mag and Aluminum Polish 10 oz. Mothers mag and aluminum polish balances a brilliant shine with easy use for aluminum intake and parts, brass, alloys, and accessories. All you need to apply it is a clean cloth and a little elbow grease. Mothers mag and aluminum polish is strong enough to put a shine on the most neglected metals, yet gentle enough to use on a regular basis.